Alpha 8.9 : Squad – Communicate. Coordinate. Conquer. We’re hoping everyone is enjoying the December holidays, and as an end of year present for everybody, we’re doing a special Holiday Patch with a couple goodies and bug-fixes to keep you all entertained over the break. 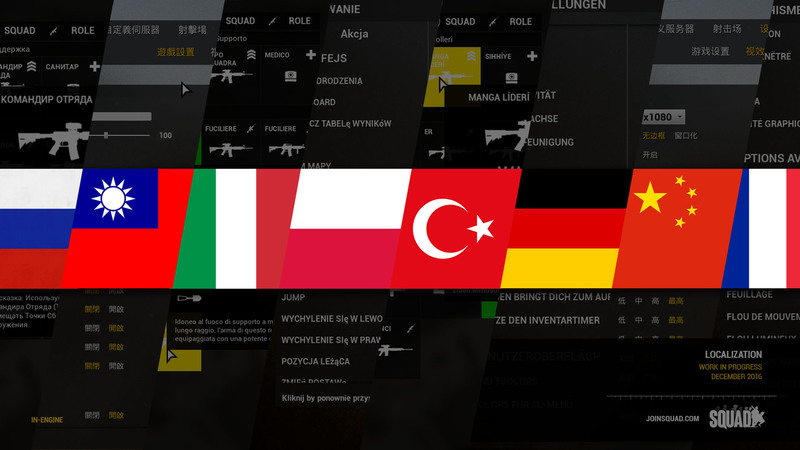 Squad is now available in a variety of languages! From this initial localization pass we have Russian, Traditional & Simplified Chinese, Italian, Polish, Turkish, German and French translations. Big thanks to our community for coming together and helping to translate and input text for Squad in their native languages. 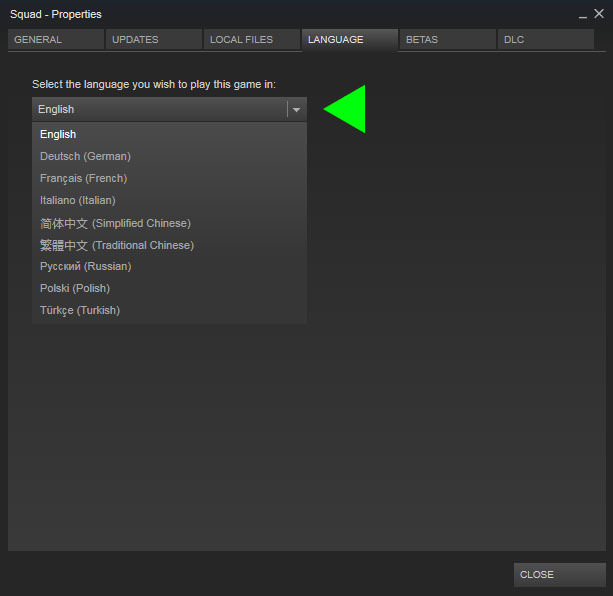 Simply go into Properties when launching Squad from Steam and select the Language setting! The SPG-9 is ready for action! 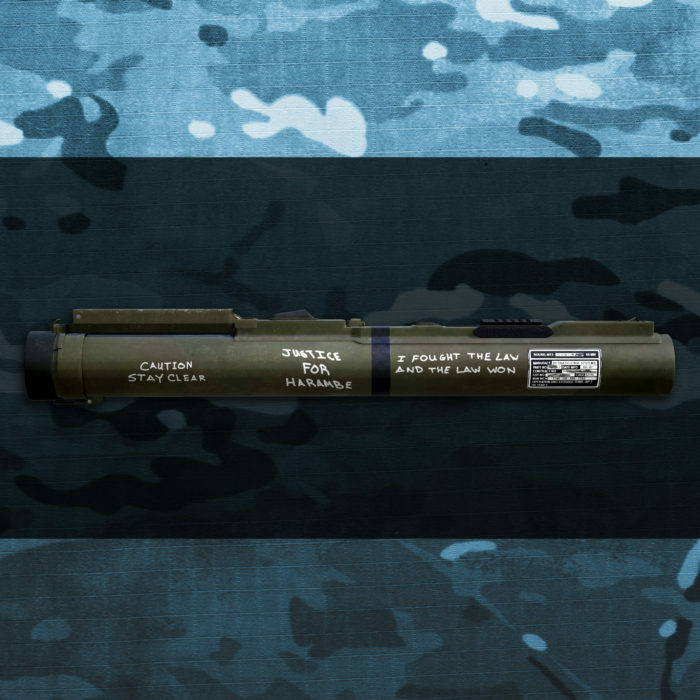 Emplaced or mounted to a technical, it is capable of firing High Explosive Anti-Tank (HEAT) rounds at velocities faster and ranges further than the RPG-7. However the gunner and weapon are extremely exposed when engaging the enemy, making this kind of weapon unsuitable for head-on direct combat, and more suited for hit-and-run tactics. Due to technical difficulties, the Veterans Day event items did not drop as intended during the November 11th event. As compensation for that, we’re running the drop event again for these items until January 2nd. So to get these all you gotta do is jump into Squad and play for an hour to get these special weapon skins! Note that these are non-transferable or tradable. The hardcoded limit for maximum player count per game server has been lifted to 80 players. This is because there are many servers out there on powerful hardware that can very well handle 80 players. The minimum CPU clock speed for servers wanting to get licensed for 80 players is 4 Ghz base clock. Servers not meeting this requirement will stay at 72 players or less depending on their hardware. Setting an inappropriately high player count on weak/old hardware may result in OWI revoking that license. Added the SPG-9 recoilless gun as a deployable for Militia and Insurgents. 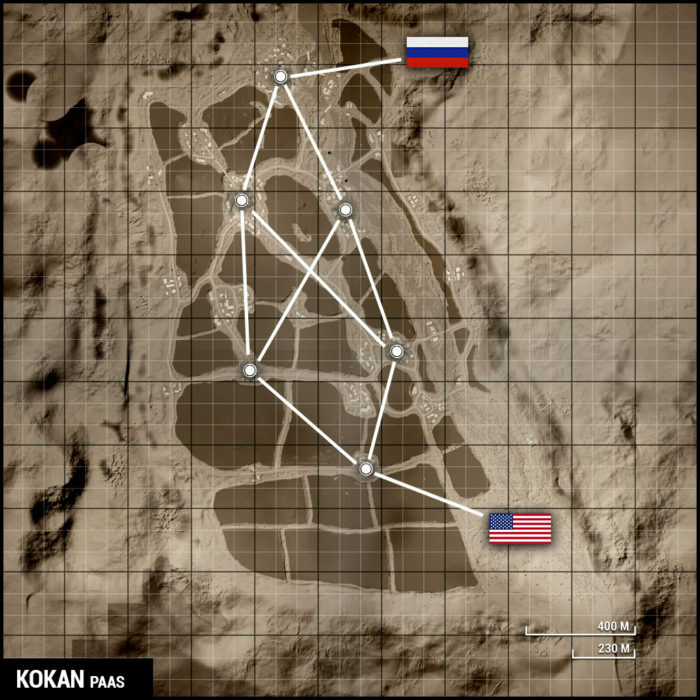 It is limited to 2 per FOB and costs 350 construction points. Currently this emplacement only has access to HEAT rounds (similar to your RPG-7) but it packs a bigger punch and it shoots it a lot faster, further and straighter. Each reload is 50 Ammo points at a FOB. 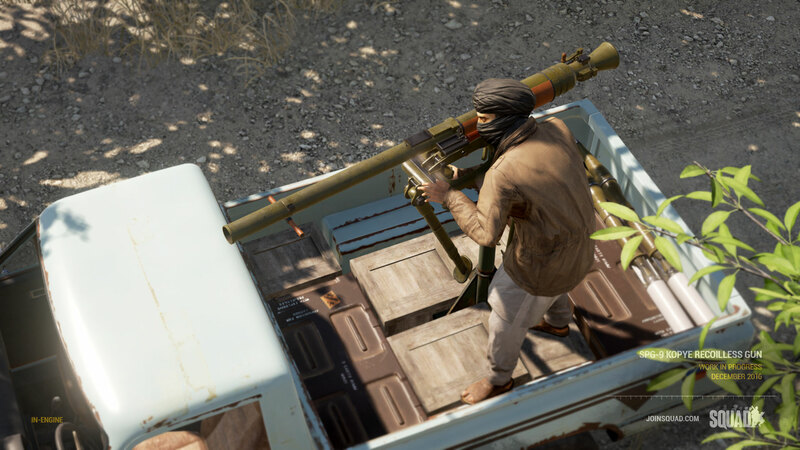 Added a SPG-9 version of the technical to Militia and Insurgents. Losing a SPG-9 technical will result in a 12 ticket loss for your team and a 8 minute respawn timer. Each reload at an ammo depot is 50 Ammo points. It holds up to 5 people. The S5 rocket fired from the Improvised Rocket Artillery Technical has had a minor buff to its explosion radius. The ammo cost of reloading the Improvised Rocket Artillery Technical has been lowered from 300 to 250 ammo points at a FOB. Lowered the respawn timer of the Improvised Rocket Artillery Technical from 18 to 15 minutes. Militia Medics now has the AKS-74 as their main weapon rather than the AKS-74U. To further emphasize the mobility play style of the unconventional factions, as well as their light vehicles being a constant annoyance for US/Russia, we have lowered the amount of tickets lost on a DShK armed technical from 8 to 6, and lowered the respawn timer from 6 to 4 minutes. Added more seats to various technical versions to further increase the mobility of the factions using them. Transport Technical now holds a full 9 man squad! Full on clown car. Logistics Technicals now holds a total of 5 people. Medics will be able to apply field dressings (bandages) 25% faster, both to himself and to friendlies. Medical treatment is their specialty after all. Added a logistics Technical to Militia on Yehorivka AAS v2 to add extra flexibility to the way the Militia team wants to play the map or the artillery. Also replaced a BTR-80 with a Transport truck for Russia. Operation First Light now has logistics vehicle for both faction as an experiment. The US has one logistics truck but Militia has two logistics technicals. Added 1-2 SPG-9 Technicals across most Insurgent and Militia map layers where applicable. In rare situations they are substituting a Dshk Technical, but mostly they are an addition to the vehicle pool. 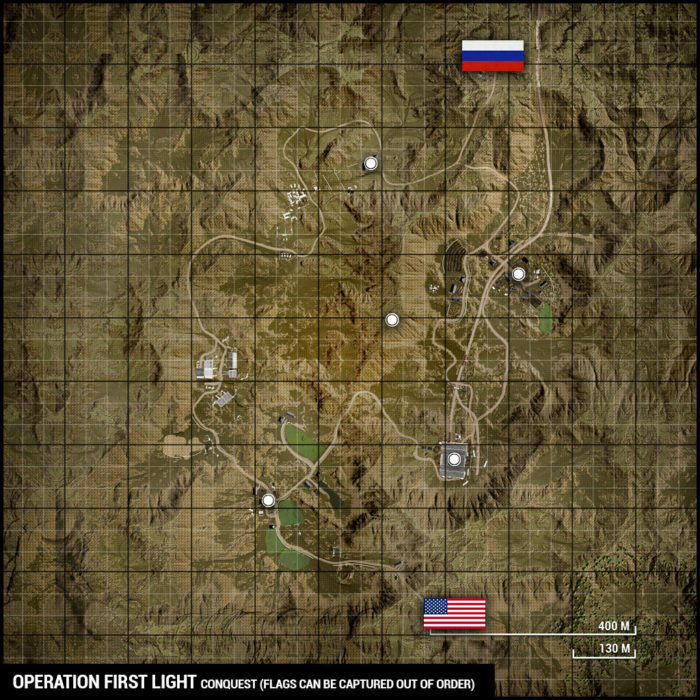 Added a Conquest Layer for Operation First Light, where the flags can be captured out of order. Both sides begin with 400 tickets and tickets are constantly draining at a rate of 4 tickets per minute per flag owned by the enemy team. Essentially the more flags you own, the slower the ticket bleed will be for your side. Fixed an issue where the logistics technicals were delivering 1000 construction and ammo points rather than the intended 500 of both. Fixed two bugs that made vehicles a lot more squishy than they were in A7. Vehicles should be back to A7 survivability again. Fixed a bug where the burn damage to vehicles were up to 10 times higher than intended. Fixed an issue where all vehicles except for the BTR-80 were taking 30-50% more damage from rifles and HMGs than they should. Fixed multiple issues which enabled you to kill the crew of armored vehicles with frag grenades and rockets. Now youll definitely have to rely on your HEAT rounds and your HMGs to deal with them again. Improved the SVDs set up a little bit. It was shooting a bit too low and a bit to the right before. It still isnt perfect, but it is better until we get a new system for handling sights. Adjusted the M72 LAWs sights so that is more useful at range. Taking shots at targets beyond 200m put the target fully outside of the ring in the sight, now that happens beyond 300m. Be aware that the projectile is slow and this adjustment has made it arc a lot, making it possible to overshoot a target at close range. Camera now shakes when you fire an explosive rocket projectile like the M72 LAW, RPG7 or SPG9. Added new way of handling rearming of vehicle weapons at a repair station. Before all magazines would instantly appear, now only one magazine appears every 7-10 seconds depending on the weapon. The above change allows us to better handle the Rocket Technical and M1151 Enhanced Armament Carrier CROWS 50cal weapon systems. These two now gradually fill up their magazine at a repair station. Rule of thumb is about 1 min for a full rearm of an empty vehicle. M1151 Enhanced Armament Carrier CROWS 50cal now has one big magazine of 500 rounds. Before we sign off, we just want to say that thanks to YOU, Squad is in the Top 100 on IndieDB’s Indie of the Year! You only have a few days left to vote, but please spread the word and get those votes in.